warm chicken tostada | Is there any wine left? Tonight was my first night of grad school! I loved class and quickly remembered how much I liked being a student. Whitney is so sweet and offered to make dinner on class nights. 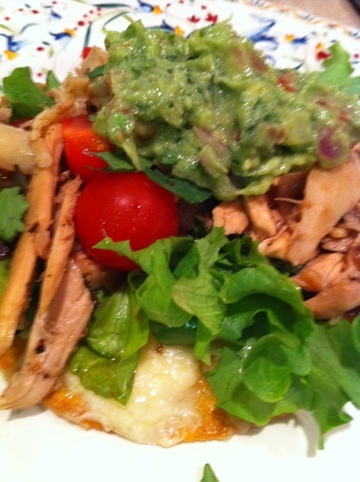 This warm chicken tostada was his first effort and it was fabulous! In a large skillet, heat 1 teaspoon oil over medium-high. Add the red onion and cook until softened, about 3 minutes. Add chili powder and garlic and cook until fragrant, 30 seconds. Add chicken and cup water and season with salt and pepper. Cook, stirring frequently, until chicken is warmed through and water is almost evaporated, 2 minutes. Stir in 1 teaspoon lime juice and remove from heat. In a large bowl, combine lettuce and 1 tablespoon lime juice; season with salt and pepper. Toss well to coat and divide among tortillas. Top each tortilla with chicken mixture, tomatoes, guacamole, and cilantro. ← a fun birthday present! Your amazing sous chef might be due a promotion! simple sunday: restaurant salsa « Is there any wine left?